Arts & Crafts oak table fitted with a beautiful and unusual charger by Kähler Keramik, Naestved, Denmark in dark blue and green and cherry decoration, incised with initials HAK. Low side table with an inset slate top engraved with blue prints of a clipper ship 'The Isiah L. Jefferson'. 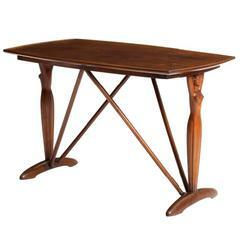 The top inset into a Regency style carved oak table base. Danish 1930s-1940s walnut side table. The dished top raised on two figurative female end supports. 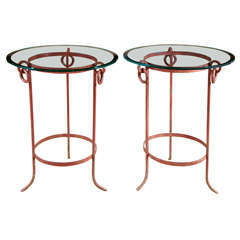 Pair of wrought iron stands with glass tops in neoclassical form. 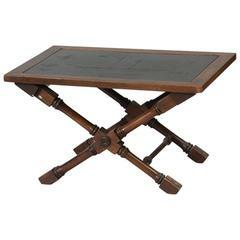 Turn of the century English Arts & Crafts four legs table with a canted corner top with carved cherubs in the four legs. Shapland & Petter of Barnstaple. An Arts & Crafts green tile top plant stand, side or hall table. A sturdy pair of Arts & Crafts circular side tables with hand formed, wrought iron scroll work details and removable glass tops. Arts & Crafts oak side table with stylistic carved frieze and cross stretcher 21" W x21" D x 24" H.
A Arts & Crafts quarter sawn oak side table, with interesting ameba form base.